Re-reading Animal Farm recently has had me looking more closely at the animals on the ranch. There are few signs of impending attempts to overthrow the humans. But each species definitely has its own distinct personality. There’s the little midget goats, just barely two feet tall with wizened beards hanging down from their chins. And their eyes: slitted, but not quite like a cat’s. Instead of that sharp oval, it’s a rectangle, and instead of vertical, it’s horizontal. It’s like what people always said would happen to your eyes if you watched too much TV. It creeps me out. 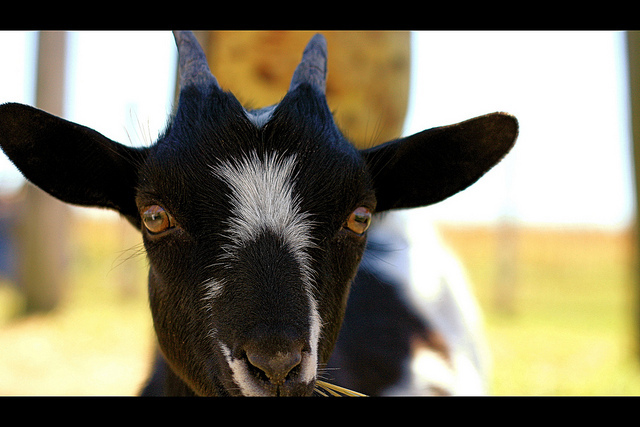 The goats think they’re sneaky; they can crawl through the fence, and when they think no one is looking, they’ll skitter out of their pen and around the farm yard. As soon as you walk over and catch them out, they bolt back to the fence, side-step over the lowest bar, then stand inside, frozen, all innocent, like kids who just barely pulled their hand out of the cookie jar before the adults came in the room. There’s Jenny, the donkey, who always walks up to the fence to get petted when she sees people, who’s gasping, wheezing brays sounds so lonely and mournful when they echo through the canyon. And Reno, the old horse, moves slowly and walks kind of wall-eyed because her hooves have grown out too much. These two are what retirement looks like for animals, I think. The milk cow, unofficially named Milky Way, has her own pen. She gets milked every morning and evening, and knows the routine; we clank around in the barn, and that means food is coming for her, a big scoop of corn and some hay. As soon as the doors open, she’s ready to plod in, diving in to her food, impatiently nuzzling the hay out of the way to get to the corn. She stands there with remarkable patience–or just remarkably absorbed in eating–as we milk her. A less patient cow might have tried to kick me the first time I tried milking her, until I finally got the hang of it. If the pigs really are the smartest animals on the farm, they sure put their intelligence to strange uses. The two of them crawl inside their trough, snuffling up the mud and making sure they snuffle up every molecule that even resembles food. They don’t move when you dump the pig bucket in the trough, but it doesn’t matter that you end up dumping it all over their heads, because they’ll eat it off of each other anyway. And the chickens are exactly what you expect chickens to be like. There are two roosters, and one lives outside of the coup, because if he’s inside with the other one, one of them will end up dead. They don’t try to escape from the coup, but if you leave the door open, they’ll eventually cluck their way out, and they’ll only go back in when they’re good and ready. I’ve seen kids try to tackle run-away chickens, and it’s pretty hilarious. I’ve seen kids try to recruit the cat into herding the chickens, and that doesn’t work very well, either. Then there are the geese. 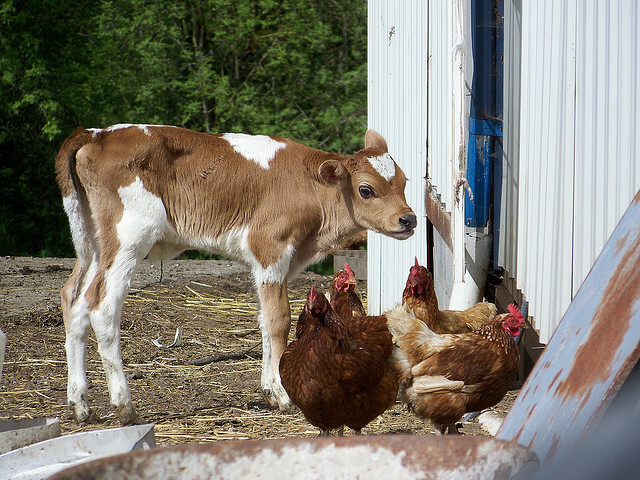 The bullies of the farm. If any animal is inciting rebellion, it’s those three. They always stick together, and squak and waddle around like they own the place. They hang out at the pig sty, waiting for someone to come over to feed the pigs. When you come too close, they stick their necks straight out and charge at you, squaking and snapping. 20 pounds, maybe, stupid little things without any teeth or claws, but when they charge, you just run. I’ve tried swinging a bucket at them, or giving them a little kick, but it doesn’t help. They’re relentless. I had to go back to the barn to get a pitchfork, and there they were, all three of them, lounging in the door like school-yard bullies waiting for the little kid to walk past so they can pester him and steal his lunch money. They started throwing squaks at me, and I started throwing rocks at the ground in front of them. I can never bring myself to actually hit one of them, so the rocks just pissed them off, and they all came charging at me, heads down, beaks snapping, sending me retreating into a corner of the barn. And they snapped and bit at my legs, hard enough that when I looked at my jeans later, they were nearly torn through in a couple places. I did the only sensible thing to do when you’re cornered by geese: flail around wildly and shriek things like “Go away!” and “No!” and “Stop it, you stupid–ow!” Until I finally realized there’s a broom in the corner that I’ve retreated to. I swatted them enough that I guess they decided it wasn’t worth it, and they grumbled their way back over to the other side of the barn. Stupid geese. I’ve saved my favorite for last. A gorgeous black cat, named Vader. As in Darth Vader! He’s snuggly as all hell, but a farm cat through and through. I always pick him up and carry him over with us to milk the cow and feed the animals. He just lounges, unprotesting, on my shoulder while I coo at him “Aren’t you a cutie-pie, Vader, yes, you are.” He sits all curled up on top of the bales of hay, watching us do our chores. When we milk the cow, he comes over sometimes, crowds in, and waits for someone to squirt milk straight from the cow’s udder into his mouth. More often than not, it misses, and Vader snaps his jaws and shakes his head at a face-full of milk. Vader doesn’t have the sense to go seek shelter when the vicious Spring winds whip up the sand. He’ll just stand there, clinging to the ground, squinting, looking like he’s about to be swept away with the swirls of sand around him, until he finally prowls back over to us with his shiny black fur turned almost completely tan with sand and dust. When you reach down to pet him then, he turns into a cloud of dust. But somehow, next time you see him, he’s completely clean and shiny black again. And such is our little Animal Farm, our little society of critters and beasts. 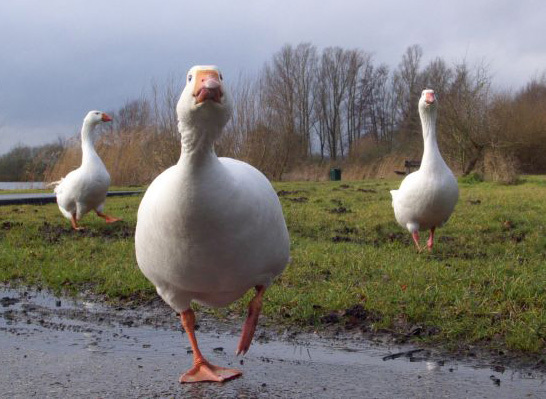 The only ones that seem to be brewing a revolution are those stupid geese. Those are the ones to watch out for.